Photos for OS X when coupled with iCloud Photo Library means you're not sure where high-resolution images live for purposes of local backups. Brian Cahoon is concerned about where his photos and other media live. As a former Aperture user, he used its vault feature to back up his library. 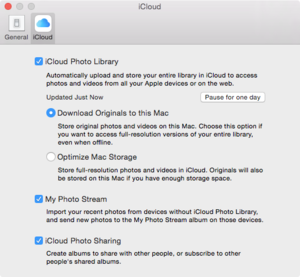 But with iCloud Photo Library, Apple gives you the option to always keep high-resolution copies locally. I don’t think I can just copy the library since some may only be in the cloud at full resolution and the export feature doesn’t create folders for years/months—it’s just a dump of all files in one folder. I have 280GB of photos going back to 2001. Any ideas on how to get a full, verified copy of my photos on a backup drive? Unless one device is set to download media originals, it’s impossible to back them all up in one place. There’s just no way around this: to ensure the ability of a complete backup, you have to anoint one computer as the place you set Download Originals to This Mac in Photos (Preferences > iCloud). It’s also possible to set that option in iOS, but I would wager that for people concerned about a backup, they’ll have more photos and videos than can fit at full resolution on an iOS device. If that option is set on none of your Macs, iPhones, or iPads, you’ll wind up with a hotchpotch of preview image and videos and their originals scattered among devices, with the “truth”—the high-resolution media—only stored for sure in iCloud. That’s problematic if you’re concerned Apple might have a server-farm meltdown and lose your originals (seemingly unlikely), a glitch that doesn’t affect everyone but just a handful of people (a high possibility but statistically unlikely for any given person), or you want to stop paying for iCloud storage in the future and switch to, say, Amazon or Google. I’ve picked a master-copy machine: a Mac with a multi-terabyte external drive where I’ve located my Photos library. It’s backed up continuously to a local external drive, as well as to a cloud-hosted backup service. In the worst case, I should have two cloud versions of everything: my backup service and Apple’s iCloud. In the best case, I can just restore from the local backup.